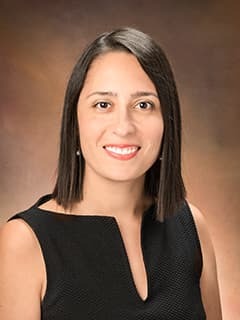 Arianna K. Stefanatos, PhD, is a pediatric neuropsychologist with the Child and Adolescent Psychiatry and Behavioral Sciences and the Metabolic Disease Program at Children's Hospital of Philadelphia. Agostino, A.R., Im-Bolter, N., Stefanatos, A.K., & Dennis, M. (2016). Understanding ironic criticism and empathic praise: The role of emotive communication. British Journal of Developmental Psychology, 10.1111/bjdp.12155. Schraegle, W.A., Nussbaum, N.L. & Stefanatos, A.K. (2016). List-learning and verbal memory profiles in childhood epilepsy syndromes. Epilepsy & Behavior, 159-165. Stefanatos, G.A., Zobel, H., Stefanatos, A.K., & Riviello, J.J. Preservation of neurocognitive function in continuous spike and wave during sleep (CSWS). Accepted for presentation at the 45th Annual Meeting of the International Neuropsychological Society, New Orleans, LA. August 2017. Stefanatos, A.K., Sarill, K., Madsen, J.R., Vega, C., Bolton, J., & Boyer, K. Short-term cognitive and adaptive behavior stability following pediatric hemispherectomy. Accepted for presentation at the 2016 Annual Meeting of the American Epilepsy Society, 2016. Stefanatos, A.K., & Nussbaum, N.L. Psychosocial Functioning in Children with Frontal and Temporal Lobe Epilepsy. Presented at the 2016 Mid-Year Meeting of the International Neuropsychological Society, London, UK. Stefanatos, A.K., & Nussbaum, N.L. Neurocognitive sequelae of frontal and temporal Lobe epilepsy: Support for network impairment. Presented at the 44th Annual Meeting of the International Neuropsychological Society, Boston, MA. August 2016. Schraegle, W.A., Nussbaum, N.L., & Stefanatos, A.K. Pattern of memory performance in children with frontal or temporal lobe epilepsy. Presented at the 44th Annual Meeting of the International Neuropsychological Society, Boston, MA. August 2016. Schraegle, W.A., Nussbaum, N.L., & Stefanatos, A.K. Memory interference effects on the California Verbal Learning Test (CVLT-C) differ based on seizure foci in children. Presented at the 35th Annual Meeting of the National Academy for Neuropsychology, Austin, TX. November 2015. Stefanatos, A.K., & Nussbaum, N.L. (2015). Clinically meaningful change in psychosocial functioning following pediatric epilepsy surgery. Presented at the 43rd Annual Meeting of the International Neuropsychological Society, Denver, CO.
Stefanatos AK. Landau-Kleffner Syndrome. Neuropsychology Seminar Series, Boston Children’s Hospital/Harvard Medical School. 2016. Stefanatos AK. Neuropsychological Contributions of the Thalamus. Neuropsychology Seminar Series, The Children’s Hospital of Philadelphia. 2015. Stefanatos AK. Neuropsychological Functioning in Children with Frontal and Temporal Lobe Epilepsy. Behavioral Health Seminar Series, The Children’s Hospital of Philadelphia. 2015.